LG Corp. has launched its latest mobile phone, popular as "Ice-cream Phone" in India on the occasion of upcoming Mother's Day on 9 May. The phone has been launched in other countries earlier and was announced for a release a few months back in India on International Women's Day. The phone is designed in a 3 coloured pattern like a triple sundae ice-cream and comes with great features to explore. The flap phones external display is light-matrix type with large keypad and touch features. 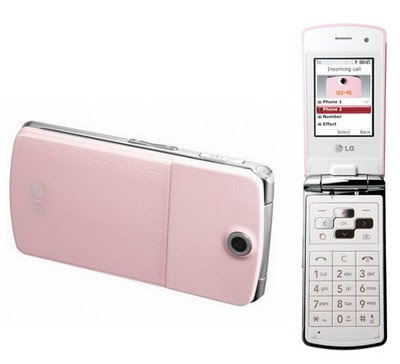 LG Ice Cream (KF350) features a 2.2" TFT display, 3 MP camera, internal memory of 30 MB that can be expanded as well with an expandable memory slot. Its FM radio and MP3 player gives great music experience and WAP 2.0/xHTML, HTML browser enables easy internet browsing. For connectivity of the users, Bluetooth, email and video telephony facilities are also available in this phone. LG KF350 price in India is just Rs 7,949.